Pastor Mike McClary knows what it means to be down and out and on the verge of despair. But he also knows what it takes to turn his life around, and for more than 30 years he’s been helping others do the same with theirs. Pastor Mike was a runaway at 13, a self-described rebellious Army private at 18 and a homeless vagrant fighting a losing battle against substance abuse soon thereafter. But in 1982 he discovered religion in a Norfolk, Virginia, mission, and three years later he was ordained a Baptist minister. He subsequently served as pastor of several congregations in Richmond, and it was there in 1987 that he founded Good Samaritan Ministries, where he now serves as executive director, working with his wife Nita. Good Samaritan is a lifeline for people fighting poverty, homelessness and addiction. It serves hot meals to the hungry and distributes clothing to the needy, and it operates a thrift store and an auto donation center. It also owns approximately 100 affordable rental units, all of them financed through VHDA. Good Samaritan’s discipleship program for recovering addicts is perhaps its signature activity. Participants – usually 60 to 70 at any given time – spend the first six months living in a dormitory, coping with drug withdrawal and learning to accept responsibility for their circumstances. During the next six months they’re taught job skills as well as how to accept authority and get along with others. They live in apartments, including those VHDA has financed, during this stage. It’s after graduation that the reality of finding a place to live kicks in, because very few of these people are creditworthy enough to find a lease on the open market. That’s where Clopton Manor Apartments come in – the most recent Good Samaritan property financed by VHDA. When the sale closes in March, its 44 units will house discipleship program graduates as well as low-income households that qualify. Good Samaritan Ministries is a beacon to people whose lives are threatened by darkness. VHDA is proud that our financing opportunities can support this program, and we salute Mike and Nita McClary for being difference-makers in Richmond. For more information about VHDA’s rental financing, please visit vhda.com/multifamilyfinancing. Low-income seniors in McLean now have a new and impressive housing option. The Fallstead at Lewinsville Center is a privately managed independent living community for seniors. 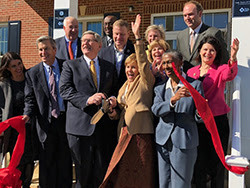 Its ribbon-cutting ceremony, held in October 2018, was attended by local and state officials, civic and business leaders, representatives of Wesley Housing Development Corp. and Hamel Builders, VHDA Executive Director Susan Dewey and many others. The Fallstead is being promoted as a place where affordable living meets enjoyable living. Its 72 one-bedroom and 10 two-bedroom units are reserved for residents 62 years of age and older whose household income doesn’t exceed 50 percent of the area’s median income. There are a host of community amenities, including an onsite fitness center, business center, library, media room, landscaped courtyard, garden and more. Ten percent of the units are designed for people with mobility impairments, and two percent for those with vision and hearing impairments. VHDA provided nine percent Housing Credits for this development. This U.S. Treasury Department-sponsored program, also known as Low-Income Housing Tax Credits or LIHTC, provides federal income tax credits to private investors who build or rehabilitate housing for low-income individuals or families. The nearly nine-acre Fallstead site has undergone several transformations over the years. In 1961 an elementary school was built there; later it was home to a 22-bed independent-living facility as well as a senior center, a childcare center and an assisted-living facility. In 2015, the Fairfax board of supervisors gave the green light for the independent-living facility to be demolished and redeveloped into the current 82-bed facility through a partnership with Wesley Hamel Lewinsville LLC. A separate onsite building is slated to house the Lewinsville Senior Center, an adult day healthcare facility and a child care center. The Fallstead’s location on Great Falls Street in McLean sits on the doorstep of a bus stop and is within a mile of the Tyson’s Corner metro station. It is a welcome and much-needed addition to the affordable senior housing inventory in Northern Virginia. One was a native of Ireland, a champion of the poor and vulnerable, a priest beloved on three continents. The other has spent a distinguished career working and volunteering for organizations that help the homeless and low-income households find affordable places to live. In October, both men were honored by the Northern Virginia Affordable Housing Alliance (NVAHA) at their Regional Housing Leaders Awards ceremony. 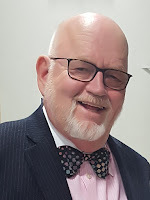 Father Gerry Creedon: Born and raised in an Irish family as one of 14 children, Father Creedon served as pastor and associate pastor of several parishes in Dale City, Mt. Vernon and Arlington over his lifetime. In addition, he held leadership positions in Catholic Charities, Catholic Relief Services, the Campaign for Human Development, the Virginia Interfaith Center and SALT (Social Action Linking Together), among other organizations. Father Creedon was founding Pastor of the Arlington Mission in the Dominican Republic; founder of Gabriel Homes for people with disabilities; and founder of Catholics for Housing. Father Creedon passed away on November 16, 2017, leaving behind a legacy of faithful service to the community. Michael J. Scheurer: Michael Scheurer is Vice President, Housing & Community Development, for Cornerstones Inc., a nonprofit organization that provides support and advocacy for those in need of food, shelter, affordable housing, childcare and other human services. He is responsible for real estate acquisition, development and advocacy activities related to the preservation and development of affordable housing. Before that, he worked at VHDA, where he managed community lending and relationship initiatives and developed strategies to finance affordable housing for homeownership and rental. Earlier in his career he worked for the Fannie Mae Washington Metropolitan Community Business Center, the National Association of Home Builders and the Fairfax County Department of Housing and Community Development. He has also served as chairman of HAND (Housing Association of Nonprofit Developers) and of HomeAid of Northern Virginia. He sits on the Fairfax County Affordable Housing Advisory Committee and is a board member of NVHAH. Based in Alexandria, the Northern Virginia Affordable Housing Alliance is one of VHDA’s many partner agencies in the commonwealth. Its mission is to promote housing affordability for low- and moderate-income households as a regional priority through education, community outreach and other means. VHDA is proud to have been a signature sponsor of NVAHA’s Regional Housing Leaders Awards ceremony, and we salute Father Gerry Creedon and Michael Scheurer for their well-deserved recognition. Breaking ground on Church Hill North. Photo by Taylor Dabney; courtesy of The Community Builders. A new apartment building for seniors and low-income households in Richmond’s East End will open in late 2019, thanks in part to VHDA’s multipronged financial support. The facility is called Church Hill North after the neighborhood in which it is located. Plans call for 105 apartments to start, with more to be added during a second phase of development. Forty-five of the units are reserved for seniors, and the remaining 60 will be occupied by households with qualifying incomes, including residents of Creighton Court, a nearby public housing complex scheduled for later redevelopment. VHDA is backing the $26 million Church Hill North construction in several ways. The first involves providing Housing Credits (sometimes called Low-Income Housing Tax Credits, or LIHTC). This U.S. Treasury Department-sponsored program is designed for tenants making at or below 60 percent of an area’s median income. It provides a dollar-for-dollar federal income tax credit to private investors who invest in the construction or rehabilitation of affordable rental housing for low-income tenants. The second way is via low-interest-rate permanent financing delivered through REACH Virginia, a VHDA program that serves as a catalyst for housing initiatives for seniors, the disabled, the homeless, low-income households and residents of high growth or high cost regions. A substantial portion of VHDA’s net revenues go toward funding REACH Virginia each year. 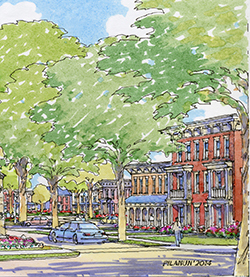 The Vibrant Communities Initiative, which is a Virginia Department of Housing and Community Development program, is also providing funds for Church Hill North – and VCI’s funding, in turn, originates in part from VHDA. VCI is involved in comprehensive community-based projects, including those with affordable housing and economic-development components. Church Hill North will open in late 2019. Speakers at the late-October groundbreaking for Church Hill North included Richmond Mayor Levar Stoney; VHDA Executive Director Susan Dewey; 7th District City Councilwoman Cynthia Newbille; Willie Fobbs, Associate Director for the Virginia Department of Housing and Community Development; and Orlando Artze, Interim CEO of Richmond Redevelopment and Housing Authority. RRHA and The Community Builders, a nonprofit developer of affordable and mixed-income housing with offices in Washington, D.C., Boston, Chicago, Cincinnati and New York, are codevelopers of Church Hill North. With its rolling hills, quaint downtown shops, wineries and bed and breakfasts, attractions of cultural and historic significance, a world-class university and other exemplary features, Virginia’s Piedmont Region is a desirable – if not coveted – place to live. The region (which includes the city of Charlottesville plus Albemarle, Fluvanna, Greene, Louisa and Nelson counties) clearly enjoys many advantages, but it also has a challenge: more affordable housing is needed. That’s why the Thomas Jefferson Planning District Commission has launched a study that will lay the groundwork for addressing the area’s housing needs. A $100,000 VHDA Community Impact Grant is the primary funding source for this study, with another $50,000 coming from Albemarle County and planning district commission funds. Community Impact Grants are awarded by VHDA as a resource for local governments that are pursuing qualified housing planning and community revitalization efforts. Some of the district’s housing shortcomings are already well documented. Affordable housing is in short supply. In some areas, the waiting lists for public housing and Housing Choice Vouchers – which serve as rent subsidies – have been closed for years. More than one in five households is cost-burdened, meaning they must spend an unduly high proportion of their income on rent, leaving them vulnerable to financial hardship. The study will delve into these issues and others and try to identify solutions. It will explore the quantity and type of affordable dwellings needed to meet current and future needs, the forces affecting their supply and the degree to which the private market is meeting the region’s challenges. This information, along with related data, will provide a foundation for the region’s leaders to draft housing policies and allocate funds. The study is also expected to build momentum for the district’s individual jurisdictions to tackle their housing challenges on a regional basis. In addition, the process will produce a template that can be used by localities across the commonwealth to complete the housing analysis required as part of the comprehensive planning process. The study’s findings and recommendations are slated to be presented in February 2019. It’s an important first step in making it more affordable for Virginians to live in, and enjoy, this remarkable region of our state. by APAH for his many contributions to the affordable housing mission. It’s one thing to recognize a troubling and pervasive social problem. It’s quite another to be a tireless and articulate advocate who presses for solutions. Affordable housing in the U.S. has just such a champion. His name: J. Ronald Terwilliger. 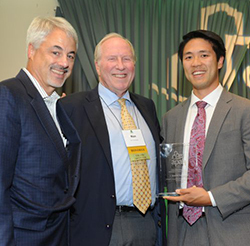 In October, he was honored by the Arlington Partnership for Affordable Housing (APAH) at an event attended by 300 people, including members of VHDA’s leadership team. This event generated $650,000 for APAH, an Arlington-based nonprofit that serves more than 1,600 low-income households living in one of the organization’s 16 affordable properties countywide. Ron Terwilliger is an Arlington native and a graduate of the U.S. Naval Academy. Now retired, he served as CEO of Trammell Crow Residential for 22 years at a time when it was the largest developer of multifamily housing in the nation. Since then, he has championed the nation’s need for more and better affordable housing. His $5 million gift paved the way for the creation of the Terwilliger Center for Workforce Housing at the Urban Land Institute, which works on the design, development, and financing of mixed-income workforce housing in Washington DC, Atlanta and Southeast Florida. Terwilliger has served as Chairman of the Board for Enterprise Community Partners, Habitat for Humanity International and the I Have Dream Foundation. He’s been active in the Bipartisan Policy Center Housing Commission and has lobbied Congress to produce a more fair and effective national housing policy. Ron Terwilliger is someone who not only understands the depth and scope of our nation’s housing problems, but who is doing something about it — through generosity, leadership and persistence. We congratulate him and thank him for his many contributions. For years, VHDA has offered mortgage products specifically designed for people like Jeff, George and Susan. VHDA’s Veterans Affairs (VA) and Rural Housing Services (RHS) loan programs allow borrowers to finance up to 100 percent of their home’s sales price or its appraised value, depending on which loan they’re getting. Even with 100 percent financing, however, neither of these products could help buyers pay their closing costs. Now, there’s a program that can. VHDA’s Closing Cost Assistance Grant program went into effect in November 2018. This income-restricted grant is only available to first-time buyers, and it must be paired with either a VA or an RHS first mortgage from VHDA. It provides funds of up to two percent of a home’s sales price or appraised value, whichever is less. The money can only be used to cover closing costs, including discount points, prepaid items, and the funding fee (for VA loans) or the upfront guarantee fee (RHS loans). Best of all, it never has to be repaid. The new Closing Cost Assistance Grant program will undoubtedly change Virginia’s real estate landscape. 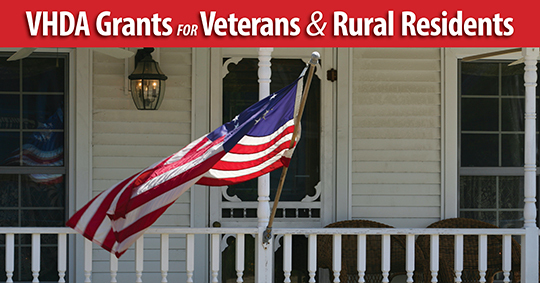 For veterans and rural residents buying a first home, it lowers their out-of-pocket expenses and eliminates the need to fold their closing costs into long-term financing that carries interest charges. In many cases, a Closing Cost Assistance Grant could mean the difference between their offer being accepted or declined. As for the bigger picture, this program is expected to create a wider and deeper pool of new homebuyers – and to position at least some of them to make offers on properties that would otherwise have been out of reach. For first-time homebuyers only (at least three years removed from owning and occupying a primary residence). Funds are limited to the lesser of two percent of the home’s sales price or the appraised value. Grant funds must be applied to closing costs, discount points, prepaid items, and the funding fee (VA loans) or upfront guarantee fee (RHS loans). Other terms and conditions apply, including income restrictions. Contact any VHDA-approved lender for details on this or other VHDA products for first-time homebuyers, such as down payment grants and free homebuyer education. VHDA maintains a database of approved lenders and their contact information at vhda.com/FindALender.